A&gt; Not the best appearance, about 1-finger of head that quickly dissipated and looked more like the head from a carbonated soda. The brew itself is clear and rusty looking. T&gt; Hops come through much stronger on the tongue. A really nice play of hops that exhibit mainly tropical/melon flavors and just a bit of citrus on the finish. The malt also makes itself known, the biscuity flavor from the nose comes through but I also taste really dark/roasty malts. Finishes hop dominant without being overwhelming. M&gt; Feels good on the tongue. Nice carbonation and not too thin, especially given that it's a pale ale. Nothing outstanding but solid none the less. O&gt; This is an interesting beer. The flavors are all pretty big without being overwhelming in the least. I can see this brew turning someone on to craft brew for the first time, but not really anything to write home about. Considering this is the 30th anniversary ale from Bridgeport, this is pretty dissapointing. This beer was really fun. No other way to describe it. I'm not a huge Bridgeport fan, but you can tell they had fun creating this beer. It threw me off because the flavor was somewhat dull upfront with a light hop profile, but the finish is just plain fun. LOTS of fruit notes, particularly mango/melon. It was completely unexpected, but made for a very sessionable beer. The rest of the beer (smell, appearance, mouthfeel) was nothing out of this world, but I'd recommend grabbing a sixer of this simply for the finish alone. Looking forward to the rest in this limited release series. 12oz bottle served in a DFH IPA glass. A - Pours a hazy golden amber with a firm white head. Good retention and lacing. S - Strong spicy and floral hops, lavender, grapefruit oil, bready malts. T - Spicy bitterness, pale malts, orange and grapefruit, melon rind, some tropical fruit, the bitterness is somewhat chalky. The hops are almost as bold in the flavor as the nose. Herbal/floral hops dominate the dry finish. M - Medium body, ample carbonation, smooth and wet with a dry finish. A spicy Pale ale that packs in the flavor. There's really nothing bad to say about this beer. If you don't like floral/herbal hops you probably won't like this. Poured into a Dogfish Head pint glass. Pours a slightly hazy, medium copper amber with a half finger white head with good retention and lacing. Aroma of biscuit malt, grassy and lightly citrus hops. Flavor follows, with biscuit malt, grassy and citrus hops, light melon fruit, flavor falls off mid-taste, but recovers to reveal some mild fruit and lingering tea and grassy hop bitterness. Medium bodied. Classic pale ale profile with a good balance between grassy and lightly citrus hops and biscuit malt. Flavor is mellow but a satisfactory variety of hop flavors. Crystal hops are kind of old fashioned now, so it was interesting to taste them again and it does bring back memories of early craft ales. 12 oz bottle poured into an imperial pint. A - A tall cap of white foam rises from being poured straight into the glass. Slow to vacate, fed by strong carbonation, and leaving it's presence all over the pint, the white suds rest on the slightly hazed, muted goldenrod-colored beer beautifully. S - "Aaah"are the first things past my lips with one whiff of Trilogy #1. Citrusy and refreshing, the aroma presents a welcome burst of hops that showcase lemon rind, fresh-cut grass, suggestions of tropical fruit, and floral hints held together by a smooth and simple pale maltiness. T - Citrus and tropical fruit pull from aroma to flavor in BridgePort's first Trilogy series beer but the bulk of the flavor revolves around the cereal grainy pale malt base that offers light flaky biscuit notes and a touch of honey. M - Nicely carbonated, incredibly smooth, easy drinking, and finished with a wonderful level of dry, hoppy bitterness, this pale ale is quite sessionable and worthy of many pairings. O - The first installment of BridgePort's Trilogy series, a Crystal dry-hopped pale ale, opens with a boisterous hop aroma that becomes a bit more conservative in flavor, mellowing out for a smooth, balanced, and drinkable beer. This tasty pale ale has "pairing" written all over it; it would compliment just about any pub fare you could throw at it as well as a handful of cheeses. A nice start to their 30th year! Pours a half finger of head on a hazy medium straw colored body. The aroma is quite nice: grapefruit and orange. The taste starts with a jab of lemon bitterness then lightens up a bit in the middle, finishes with a strong lemon and pine bitterness. Nice profile. The texture is crisp with some nice fizz. Great aroma and good tasting. Appearance- Pours up an okay amount of head (about a finger's worth) which has poor retention. The head is pure cotton white while the body is a dull pale amber which appears as a mix of pale amber and golden straw when held up to the light. Lacing tends to sheeting at the moment. Nose- Not a whole lot of presence. Initially, I got touches of citrus (mostly orange and lemon) and a tiny amount of pine and resin from the bottle, but now I get nothing. The glass showed some fleshier, softer fruit (maybe peach, a little bit of mango) but now shows a tiny bit of caramel. Fairly subdued. Swirling shows small amounts of peaches and mango. Taste- Has a front of vague citrus, then flashes notes of grain which build into huge cereal notes throughout the middle with a slight touch of bitterness on the finish. Some wood and spice. A hint of pine and resin. But from the initial taste, the biggest aspect is the warm and toasty cornflake nature of the middle. Not really what I was expecting from a pale ale and at the moment, it's inviting. Let's see if that lasts. Some chalkiness on the next taste which shows bigger hop notes on the front- citrus (orange, lemon, some grapefruit) and fruit (peach, mango) notes that reflect the nose. There is still a warm mix of grain, cereal, biscuit, and cornflake but it has moved closer to the finish and I would have to say that it works in this beers favor. There is almost no hops on the back end and I'm good with that. Some pine and resin punctuated throughout the flavor profile but nothing that distracts. Somewhat different for a pale ale but pretty much a solid, good beer. Maybe above average to good, but mostly good. Mouthfeel- Between light and medium bodied with some syrup to the texture. Little bit of a dry finish. Appropriate amount of carbonation that is a tad bit carbonic. Drinkability- Pretty easygoing and is interesting enough for a pale ale to be sessionable. Pretty standard craft beer price and something I could see myself picking up again. Overall- Above average to good, but pretty much just good. It somewhat straddles the line between an APA and a lager and has enough of the good parts of both to make any interesting beer that's a little different. Worth a try based on that alone. Look: Slightly hazy, muted copper color. An eggshell colored head dissipates to a light film, while watery lacing sticks to the glass momentarily. Aroma: Subtle malt sweetness, then spicy, piny hops. Taste: Just like the aroma, there's a touch of malt sweetness at first before being swallowed by a tea-like tang and spicy, woody hops. Mouthfeel: Medium bodied, dry finish. Overall: On the verge of outstanding, but still very good. Bridgeport's tapered 12oz bottle served in pint glass. Beer pours pale golden in color with an impressive white head. Big, super fruity, fresh hop aroma. Really, this smells like a bowl of oranges. But this is no IBU monster. Just totally respectable American pale ale with a serious load of dry hopping. The beer is not totally dried out and leaves my palate a little bit sweet, though maybe that's just because I'm expecting a beer this aromatic to be more bitter. Still, I think this is solidly sessionable. Fairly clear, golden orange with a thin foamy white head. Floral, lightly spicy hop character with a crackery malt backbone. 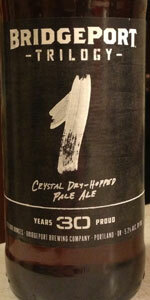 An enjoyable, well done done pale ale, though nothing particularly memorable or exciting.